Patience. – Dirty wet dog , boats and sailing. I am told that patience is a virtue, i wouldn’t know being one of the least patient people i know but that’s not what i am talking about here. 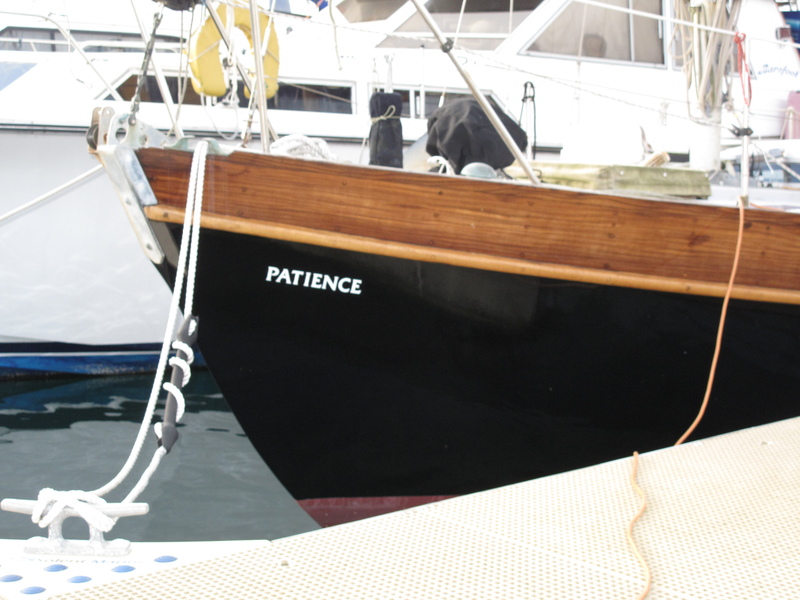 The ‘Patience’ seen here in Falmouth is definitely not a Virtue and i’m not exactly sure what patience is but definitely not a virtue : nice boat though and i have always like the deck-edge principle for space inside a cruising boat. Below though is a virtue or rather a pair of them photographed at Dandy hole several years ago when i still had my Frances 26 . I don’t know what the 2 virtues are named although i just thought of them as ‘slow’ and ‘slower’ having just spanked the knickers off both of them in an impromptu race up to dandy hole : and upwind too. Both owners were sulking and wouldn’t talk to me after being outsailed in their alleged classics by a pikey scruff-bag in a no-nonsense cruising Frances 26,j ust don’t tell them that i was flying brand newcustom sails and sailing on a silky smooth bottom which had been wet sanded to racing perfection. I know that people who like the Virtue as a class love these boats but i think they get the same problem as many Folkboats ie take a great slippery hull and stick an ugly kennel of a cabin on top and so spoil them. I would love a proper Folkboat except i know that sailing one would terminally wreck my back !……note to self : do a Folkboat cover some time. Seriously though : patience and the sailor. It has been said that patience is the first and possibly only virtue of the sailor : you know the kind of thing , waiting for tides, weather and suchlike. As i have said before even ‘fast’ boats are pretty slow and going anywhere in the Uk is dominated by foul tides so we may as well relax a bit and stick the kettle on while waiting for a tidal lift around a headland. Actually i think that tides are a great idea : when they are against me which lets face it is half the time its a great excuse to anchor, kick back and just enjoy the day or at least get a into a good book. Patience has never been one of my virtues anyway, at least not according to my partner and what little patience i had or have gets used up on patients !….ouch. Strangely enough my grandparents at least thought i had incredible patience as i spent hours as a kid making models : i reckon i was just living in steve-world which was generally a much better place anyway. To be honest when i think about virtues i can’t actually think of many, at least none that i have ever possessed : lets say ‘sobriety’ ….come on i am an ex professional sailor known to enjoy a tot of rum although i hardly drink now….chastity perhaps !…..sorry but are you s**ting me. Better perhaps to be at least a little honest and confess to the many vices i have enjoyed as a sailor and here is a thought : rather than have a rather pretentiously named classic lets have the exact opposite and maybe a re-visit of my FFS 17 and a bit design : you know, the consciously worst boat possible with every bad design feature going . I guess we should re-name the class the ‘Vice 18’ so we could then name the lead boat as ‘Dishonesty’, my one of course would be called ‘Sloth’ one for a mate of mine could be ‘Lust’ and so forth. If you are now wondering whether i have been adding some strange chemicals to my coffee this morning fear not, i am fascinated by boat names : both the sweet/cute and the weird/pretentious and of course ‘Patience’ seen above piqued my interest. The name of my boat is actually a Zen-like pun, a few days we sailed past ‘Gladys’ and ‘Esmeralda’ which made me grin somewhat. Going back a bit i don’t know whether visitors here remember this but there was a trend to make up a boats name from the names of the owners daughters : ‘Taramber’ immediately comes to mind as i sailed on her once and that i guess was Tara and Amber. A few of these worked quite well and the name did at least have some charm and phonetic sense : one that i saw and asked the owner about didn’t work at all. I can’t even remember the actual name as it wasn’t even pronounceable at least in English : the story goes that her German owner had taken the names of his 3 daughters and thrown a few letters of each together : the problem being that he was a great Wagnerian fan and had named his daughters for the heroines in Wagners opera’s. I mean what a terrible thing to do anyway but just imagine trying to make a boat name out of them afterwards : German humour at its finest i guess.